This is an easy recipe for slow cooking pork tenderloin in your crock pot. Spray crock pot with cooking spray. 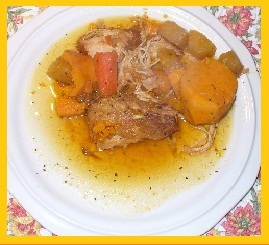 Cut pork loin in half and place in crock pot. Add salt and pepper. Turn on low. Combine all other ingredients (except carrots and sweet potatoes) and add to crock pot. Stir. Add carrots and sweet potatoes. Cover and cook on low heat 8-9 hours. Serve. This recipe is good with sauerkraut as a side dish.